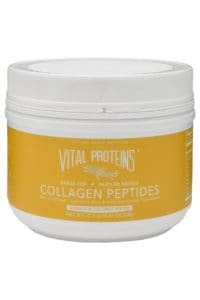 Why do I take collagen, what even is it, and what results have I seen? 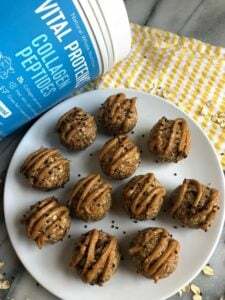 I’ve recently had a lot of people ask me why I take collagen, so I wanted to come on here and share more about my personal experience since I started taking it. So, what even is collagen and why would we need to take it? 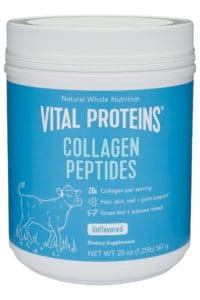 Collagen is a protein that is found in our bones, muscles, skin, and tendons and is the main component of connective tissue. As we get older, the amount of collagen in our bodies declines so these supplements are able to help us continue improving our skin, hair, nails, joint pain, digestion and overall quality of life. So how did I get into started with taking it and why? I like to call myself indifferent when it comes to health trends. I’ve never been one for following the latest trends, but I’m also not against giving them a try – I’m “indifferent”. I don’t have a ton of money to spend on them and there are way too many out there. One day eating XYZ is good for you and the next its causing cancer. So it’s safe to say I’m open-minded, but I’m also very hesitant. I felt this way with collagen until a company reached out to me about trying their collagen product. I was excited to try it only because I had heard other bloggers talking about how they really have enjoyed adding it into their diet, so I began by taking half a scoop one time a day (primarily in my hot coffee every morning). Plus, they offered to send me a sample, so why not just try? Holy crap. Right when I poured their collagen into my coffee, I noticed the difference between the quality levels. VP’s was perfectly powdery, dissolved completely, and had absolutely not after taste at all. 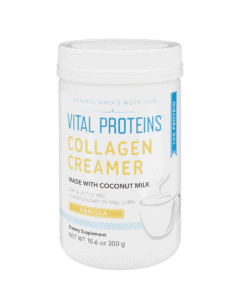 I started adding Vital Proteins collagen to my diet every single day, using the different flavored ones in my coffee (the vanilla collagen peptides and the vanilla collagen creamer are amazing in coffee), drinking the beauty water in the afternoon, and even taking the stick packs with me while traveling. After a consistent six weeks of use, I really started to notice in the strength and health of my hair, nails, and skin. And yeah it did take at least a good six weeks to notice any major changes, but you can’t expect to notice those changes overnight – just be consistent with your use and you will see results! My hair. The first time I noticed a different was when someone commented on the fact that my hair had gotten so long and looked so healthy – and this was after I had gotten four inches off one month earlier. I typically only get one haircut a year, but I now need one at least twice a year. But the real kicker? THESE LITTLE BABY HAIRS ALL OVER MY HEAD. You’ve probably heard me talk about them on Instagram, but I’ve never had them before and I now have so much more hair growing in. It’s actually crazy, but also super exciting because my hair is healthiest its been in years. It’s so cool to actually see your hair change, so I’ll take those little baby wisps any day if it means my hair is going to be fuller and healthier. My nails. They have grown fast. Fast to the point where I used to be able to schedule a manicure every 3-4 weeks and now I’m cutting them TWICE between manicures (yes, this is my little treat to myself). I’m okay with it though, because my nails have been stronger than ever. I’ve also heard a lot of people comment on the fact that their nails are no longer so brittle. My skin. I’m lucky to admit that I’ve never had bad acne or bad skin problems, except for it being very dry. I know several people who talk about how collagen has really helped clear up their skin. I cannot speak from experience on that, but I can speak about the fact that this was the first winter where my skin wasn’t completely dry all the time. I like to think that was partially due to the addition of collagen into my diet, but who knows. Other benefits of collagen: many people love the fact that it helps their joints rebuild, recover, and not ache after workouts. The protein in it can replace protein powders and can help enhance muscle growth. Luckily, I’m still pretty young so haven’t had TOO many joint issues yet, but I still enjoy taking it after a workout. Well as I said, I love putting it in my coffee. I do it every single morning! It dissolves super smooth and all I have to do is stir, however I do love using my hand frother (game changer). I also add a scoop to my oatmeal right before I start cooking it, put it in all my smoothies, my protein balls, granola bars, tahini freezer fudge, and even my baked goods. There is absolutely no taste, unless you buy a flavored one of course. For any time I’m drinking an iced coffee, I will mix the collagen with a little bit of hot water first to create a paste, and then add it to my drink. It helps it dissolve faster! You can even use their bone broth for savory cooking, which I haven’t tried yet but am so excited to give it a go. The possibilities are endless. They even offer a sampler pack if you aren’t sure what you would like and want to try them all out. To make it even better, in one serving you are adding in 20 grams of protein to your diet, so I typically don’t have to also add in a protein powder, especially if I’m doing this twice a day (I normally only do 2 scoops a day total). They also offer a marine collagen for vegetarians/pescetarians, but the other collagen is from grass-fed cattle. I would recommend starting with one of these if you’re looking to dabble in the collagen world. Currently, VP doesn’t offer any sources of vegan protein. So if you’re looking to try it out I would definitely recommend starting either with the sampler pack or the regular collagen peptides, so you can see what it is you like best! There are tons of products on their page that I’m slowly making my way to try them all. For more questions, Vital Proteins has an amazing FAQ page with tons of questions answered. I hope this helped!! Please reach out with any questions. Disclaimer: Please note that there are affiliate links on this page and I will earn a small commission if you purchase through those links, but all of the opinions are my own! Hello Erin, I’m curious why you switched to VP after you didn’t see results from the first collagen product. What prompted you to try another brand? I’m like you, I don’t really follow the hype, but once in a while I’ll try something, and if I do, I generally give up because the hype was just that and too pricey. Hi Maggie! I switched because I didn’t see any results and I wasn’t quite ready to give up yet…so I switched over to VP. I was so pleasantly surprised at the difference and honestly love the results I’ve seen. Yeah it’s a little pricey, but a tub of it lasts me over a month (sometimes even longer) so it’s worth it.